Color mixing just got messier! 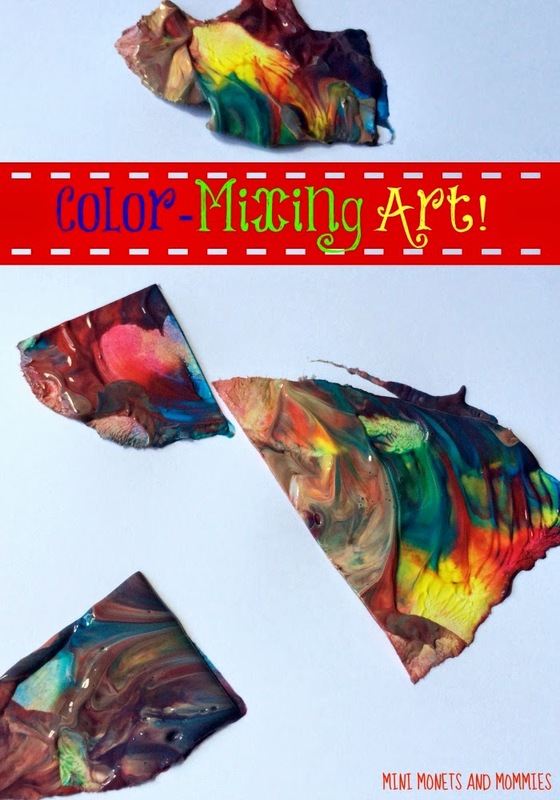 Ok, so some of this is actually less-mess- but your child can make a creative color concoction that she uses later on for a collage craft or other art activity. I’m all for mixing new colors. I spent years teaching children’s art programs at a museum. In the studio we never, ever, ever, ever gave the kids anything to paint with other than the primaries and white. Taking away the rainbow makes your child problem-solve and think about how she can make those purple butterfly wings when she only has red, blue and yellow. 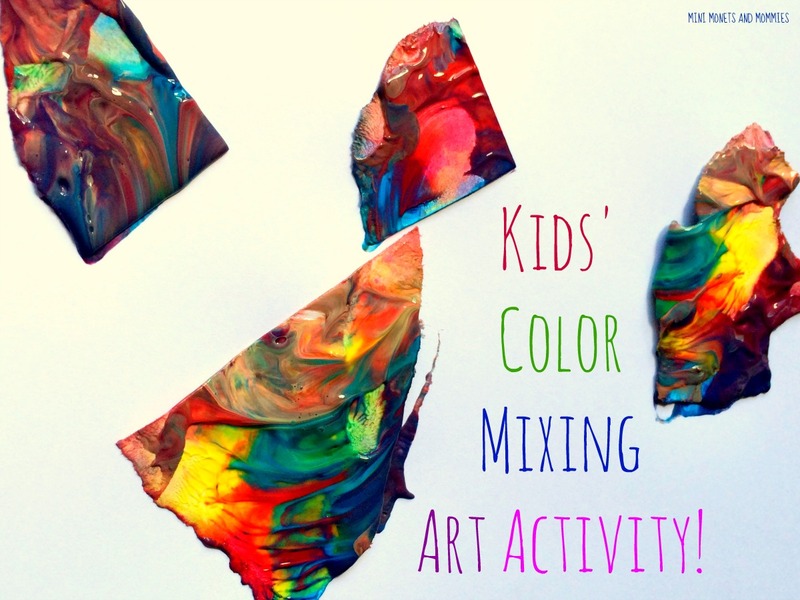 This art activity lets your child mix away in a totally random way. She needs to think about which colors she’s using, and then use her fine motor skills to mix and mash them up! The result? Rainbow swirled paper that she can use later on for other artsy adventures. · White card stock paper – Your child can use construction paper, but the thicker stock stands up better to the paint. · Tempera paint – Red, yellow, blue and white. · Optional: Glitter—Who doesn’t love a special sparkle? 1. 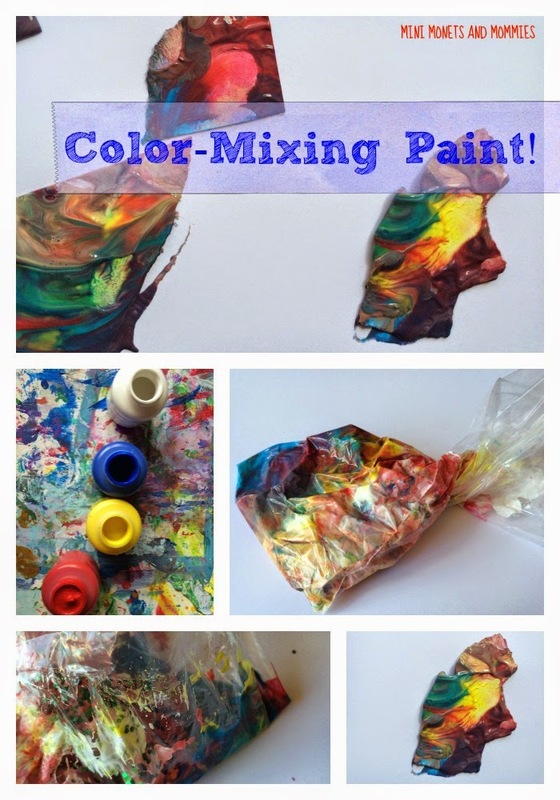 Pour a few dollops of at least two paint colors into a bag. Go over the art vocabulary, giving your child the word “primary” for the red, yellow and blue and “secondary” for the orange, purple and green. Your child may opt to add three or all four colors into a bag. 2. Repeat to make a few more baggies of paint. 4. Add the shapes to the paint bags. 5. Close up the bags by pressing or twisting them shut. 6. Mush, mash and squish the bags. Isn’t it fun? Add some glitter if your child wants. 7. Open the bags and pull out the painted paper shapes. 8. Set the paper aside to dry before using it in another craft. When the paper is dry your child can glue it down onto a piece of cardboard to make a collage or even use it in a paper mache project! Are you looking for more creative kids’ crafts? Follow my Pinterest board for ideas. Thanks! It is a lot of fun, and not very messy too!